All delivery companies listed on this page are independent carriers or personal delivery carriers. 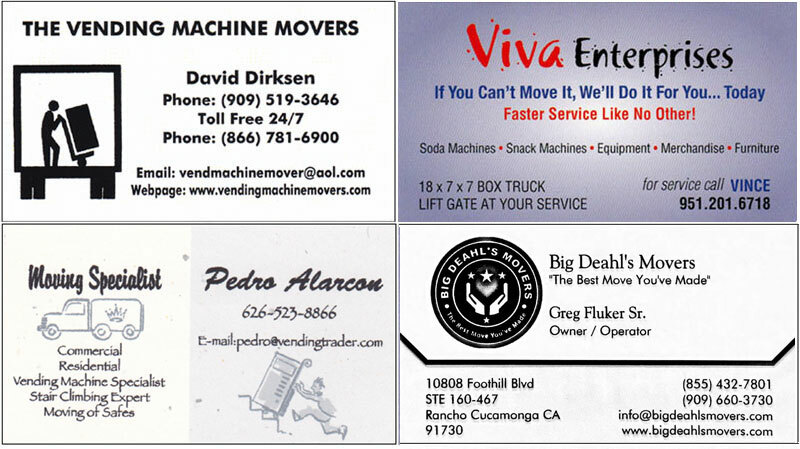 Vending World does not in any way endorse or encourage the use of these delivery companies. The information listed above about these companies is a courtesy only. Should you, as a customer of Vending World choose to use any of the delivery companies listed on this page you do this with the understanding that you (customer) are contracting the services of these companies yourself. Vending World has no knowledge of the transaction between you and the delivery company and shall in no way be held liable for any actions that occurs between you (customer) and the delivery company. This includes but is not limited to pricing, damage to equipment, incurring liability due to actions of the delivery company. Call the local movers to get an estimate of cost to move your equipment.